We all like to admire ourselves in the mirror from time to time, but there’s a bird in Australia that seems to have developed a rather unhealthy fixation, gazing upon its reflection for hours on end while seemingly oblivious to its surroundings. It’s pretty funny, but should we be worried about this fine feathered fellow? As reported in ABC News, the bird, a bush stone-curlew, was photographed earlier this week outside a building at Queensland University. The photographer, Nick Wiggins from ABC News, posted the image on Twitter, and it quickly went viral. The bird has spawned a series of memes and its very own Facebook page. Caitlin Raynor, a volunteer with Wildcare Australia, placed sign on the window that read, “I’m a bush stone curlew. I’m fine. 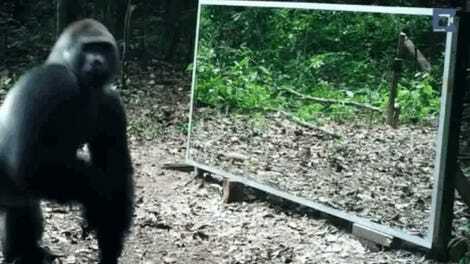 I just like to stare at myself in the window.” As she told ABC News, it’s fairly odd but common behavior for this particular species. Indeed, bush stone-curlews are known for their reflection-obsessing behavior. 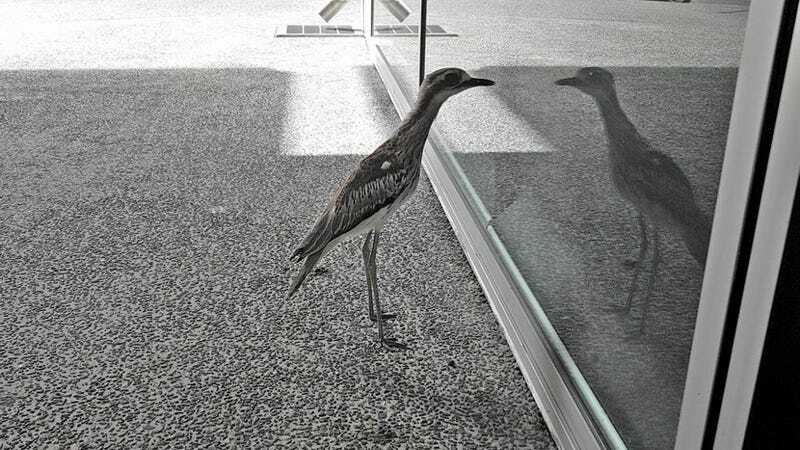 Back in January, another curlew gazed into a Brisbane office window for hours. Wildlife officials told concerned office workers that, because the bird is nocturnal, it becomes hypnotized by its own reflection during the daytime. The workers were told it would fly away at sundown, which it did, but it kept coming back. Concerned citizens from the building next door left a bowl of water for the entranced bird. Sometimes, it would get so exhausted from its efforts that it would sit down on its haunches. Kevin J. McGowan, a biologist at the Cornell Lab of Ornithology, says this is a variation on another unusual behavior, birds fighting with their reflections. McGowan says the stone curlew is generally an odd bird. Also known as think-knees, he says they’re mostly nocturnal shorebirds of open areas that are highly camouflaged, and hide in plain sight during the day by standing still. The scientists say that the best thing to do when encountering these birds caught up in their own reflections is to just leave them alone. Eventually, they’ll snap out of it. But if it becomes a persistent issue, there are solutions, such as covering the window with posters to get rid of the bird’s reflection. Which, in the case of one Australian curlew, is exactly what what had to be done.